Rent-A-Thug » Archive » Pure Speculation, coming soon! The Pure Speculation Festival is coming up on October 18th and 19th, 2008! It’s going to be at the Hazeldean Community Centre again, which proved to be a very gracious host last year. I’ll be there as a vendor again. I’ll be bringing copies of Rent-A-Thug: First Offence (36 pages, including ten print-exclusive pages, for only $5! ), Rent-A-Thug baseball caps ($25, very limited supply), and Charlie No-Aim and G-Fresh prints (only $1 each!). 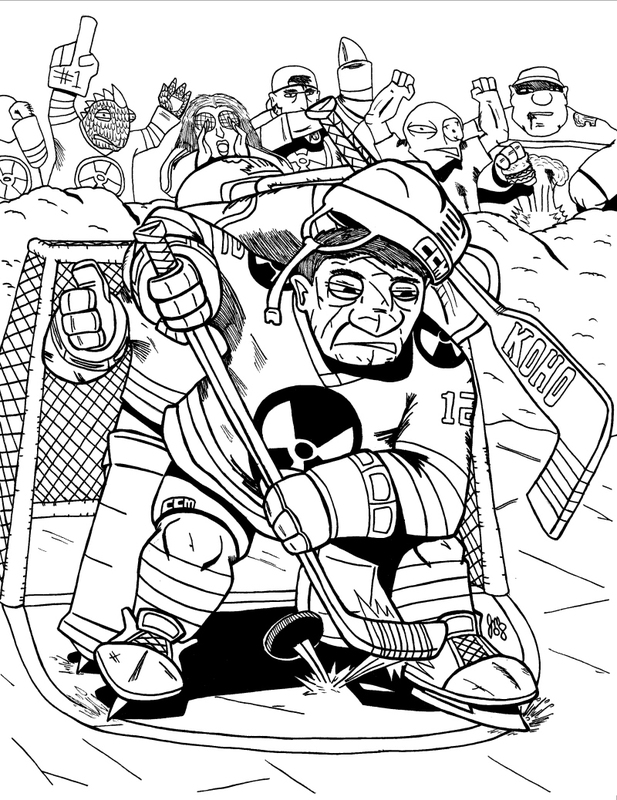 I’ll also be debuting a new print, Hockeypocalypse (also only $1). I’ve had a bunch of people ask for that illustration to be made into a print, and now it is! I’m also going to be working on a piece for the Pure Spec art show, although I’m not sure what exactly it’s going to be yet. It might be Hockeypocalypse-related. The Oilers pre-season just got started a few days ago and it’s got me itchin’ to draw some hockey playing mutants. In non-Pure Spec news, I added three new drawings to the Illustrations page. I’ve been doing research on the Canadian Corps fighting in World War I for one of my classes and it got me inspired. Speaking of illustrations, I did a drawing for Rudi Gunther of Deathworld fame that popped up in his guest art gallery at some point without me noticing it. If you want to see a big ol’ robot, check it out. So to recap: I’ll be at Pure Spec, come say hi. Also, Steve Rolston of Queen & Country fame will be there. And game designer Monte Cook of D&D (and like a thousand other RPGs). I have no idea how the Pure Spec folks managed to get such big-name guests, but good on ’em for it. This entry was posted on Thursday, September 25th, 2008 at 9:12 pm and is filed under Blog. You can follow any responses to this entry through the RSS 2.0 feed. You can leave a response, or trackback from your own site. It’s funny, not really like anything I’ve really seen. I’ll probably dig deeper into your archives later but I like what I’ve read. 😀 The writing’s pretty fun and the simple art’s well suited to it.